A/V RoomService, Ltd. specializes in noise control and sound quality design, modeling, testing and voicing, as well as acoustical products. Visit us at www.avroomservice.com for more information. This blog mainly includes acoustical tips for critical listening spaces. Symmetry of the audio scene, especially the front horizontal plane, is important to accurate reproduction. We want to place ourselves in the middle of the left and right image in order to hear the proper soundstage. If we don't balance levels correctly, spatial cues, frequency response, low-level details, etc. become skewed because the energy on one side of us is louder than the other. This is true with headphones, but is even more problematic when sound is introduced to a room. Lately, I've been seeing a lot of designs that are incorporating off-center speaker/listener arrangements in the room. The idea is to avoid the room's fundamental width cancellation node by moving away from it. This is not practical for high fidelity. Axial room modes in a rectangular room are fairly predictable using simple math. Since room modes are dictated by room dimensions, we can calculate what frequencies will live where in the room. 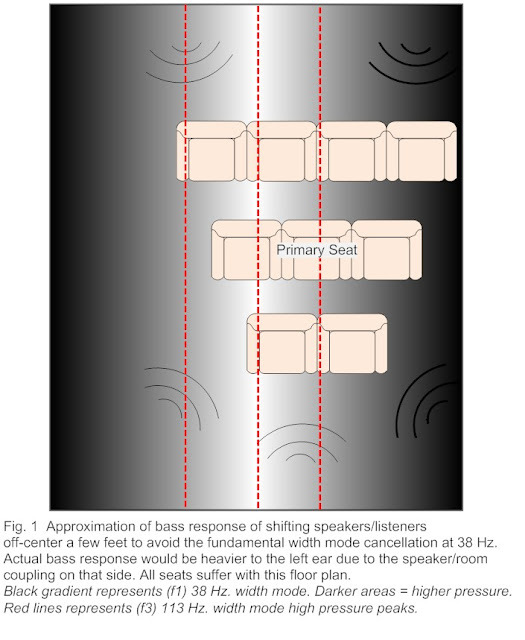 We want to avoid coupling the woofers and listeners with the existing first, second and third-order modes whenever possible, as they are the most energetic. Avoid placing woofers in antinodes (pressure peaks), and listeners in both nodes and antinodes. Placing speakers in an antinode will excite it, resulting in that frequency (and its harmonics) sounding louder than they should. Placing a speaker in a node (null) will attenuate that mode, which at times can be useful. Placing a listener in an antinode results in the mode sounding too loud. Placing a listener in a node results in the mode sounding too soft. There is always an optimum position for the speakers/listeners in a room to deliver the best soundstage and bass response. The fundamental (f1) mode wavelengths are too large to move away from. The fundamental wave supported in a 15' wide room is about 30' long (38 Hz.). The longer the dimensions, the longer the lowest wavelength. You would have to move off-center about 3.75' to smooth out a 38 Hz. null. By doing so, you’ll just end up in another mode. In a 15' wide room, 3.75' off-center, you'll find f3 (113Hz.) at its peak. By doing so, you’ll end up too close to the side wall, which will cause timing differences between your left and right ears, resulting in severe spatial skewing. By doing so, you’ll end up too close to the side wall, which will cause energy differences between your left and right ears, resulting in resolution loss and inequality. By doing so, you’ll end up too close to the side wall, which will cause frequency differences between your left and right ears, resulting in severe timbre skewing and inequality. Let's look at what happens at these low frequency room modes. If we took an instantaneous time snapshot (1/75th of a second) of the first-order (f1) width mode in a room 15’ wide (38 Hz. ), we would see a positive pressure point to our left, and null in the middle of the room, and a negative pressure point to our right. At the same instant, the second-order (f2) mode (75 Hz. ), which is half the length of the first, would show a positive peak at the left wall followed by a null (located about 3.75’ from the left wall), a positive peak in the middle of the room, and a null (located 3.75’ from the right wall), followed by a positive peak at the right wall. We want to avoid the third-order (f3) mode as well (113 Hz.). You would have to move 3-4’ to one side before you would notice any appreciable frequency smoothing of the first-order mode, which moves us into to the f3 antinode at 113 Hz. This particular frequency is contained in nearly all music and dialog recordings. Not a good move (see Fig. 1). In summary, we must place the audio footprint center of the side walls and settle for the rare, problematic bass note, over distorting all frequencies, all the time. Placing the auditory scene symmetrically between the left and right walls provides optimum dynamics, tonality, imaging, spacial cues and low-level resolution. Norman is an acoustician by trade specializing in noise control and sound quality of small rooms such as; home cinema, recording studios, conference and class rooms. AV RoomService, Ltd. provides acoustical design, modeling, testing, voicing and products world wide. His company website is www.avroomservice.com. Norman has been listening, playing (drums & percussion), recording and playing back music since grade school. He has a $100k dedicated listening space and over 5,000 LPs, etc. He likes all kinds of music other than rap and other cheap, commercialized crap.